The average electricity retail price in Vietnam officially increased by 8.36% from March 20, 2019. The new power retail price is VND1,864.44 per kWh (exclusive of VAT), higher than the previous rate by VND143.79 per kWh. The retail price of domestic electricity is still divided into six levels, with the lowest at VND1,678 per kWh and the highest at VND2,927 per kWh. The wholesale price also ranges from VND1,646 per kWh (applied to consumption of 0-50 kWh of electricity) and VND2,871 (applied to consumption of more than 400 kWh). Mr. Nguyen Anh Tuan, Director of Electricity Regulatory Authority under the Ministry of Industry and Trade, said the decision on the power price hike was implemented according to Decision 24 of the Prime Minister and is based on impact factors on electricity prices, including input costs in power generation, transmission, distribution, retailing and management. In addition, the new price was also affected by exchange rate differences not counted in previous prices. He added that all input costs for power production go up. For example, an increase in coal price resulted in extra VND3 trillion of coal cost. With the second price growth, power production may incur additional VND2 trillion of coal cost. Vinacomin also spent VND1 trillion more on imported coal. According to the direction of the Government, some items of exchange rate differences “suspended” in previous years must be included in electricity prices this year, he added. With different exchange rate allocation scenarios, the Ministry of Industry and Trade calculated different price increases. “The calculation of impacts of electricity prices on macro indicators is also based on the calculation of the General Statistics Office. Then, the Ministry of Industry and Trade have the ground for the price rise of 8.36%,” said Mr. Tuan. The Ministry of Industry and Trade coordinated with the General Statistics Office (GSO) to calculate possible impacts. The power price growth of 8.36% will result in a 0.22% shrinkage of GDP and a 0.29% growth of consumer price index (CPI). “Together with other solutions, GDP and CPI targets assigned by the National Assembly will be ensured,” said Tuan. He explained, given the price hike of 8.36%, household customers using less than 50 kWh a month will pay an additional VND7,000, customers using 50 - 100 kWh will pay an additional VND14,000; customers using from 100 - 200 kWh will pay an additional VND31,000; and customers using 200 - 300 kWh will pay VND53,000 more. According to statistics, among about 25 million domestic power customers, 35.6% use less than 100 kWh a month, 15% using over 300 kWh and 7.9% using over 400 kWh. Thus, low-level customers account for a high share. 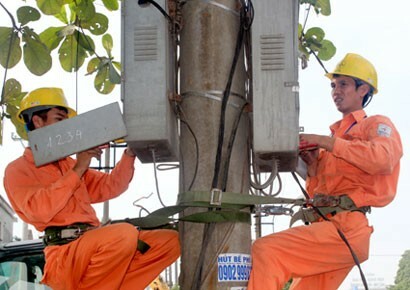 According to data from EVN, the country has about 450,000 customers using electricity for business purposes. Each customer will pay an additional VND500,000 a month on average, Mr. Tuan estimated. The country has 1.413 million manufacturing consumers, each paying VND12.9 million a month on average. They will pay VND869,000 more each. As for very big power consumers, the Electricity Regulatory Authority conducted a survey into 40 big power consumers like steelmakers and cement makers. In cement production, some customers will pay 7% more of power bills while steelmakers will pay at least 5% more (VND50 million).